To call Alex Ross a cartoonist is unfair. Instead of putting bright, flat colors between black lines, his illustrations are more like formal paintings. The museum-like quality of his art raises his superhero subjects to almost royal status. 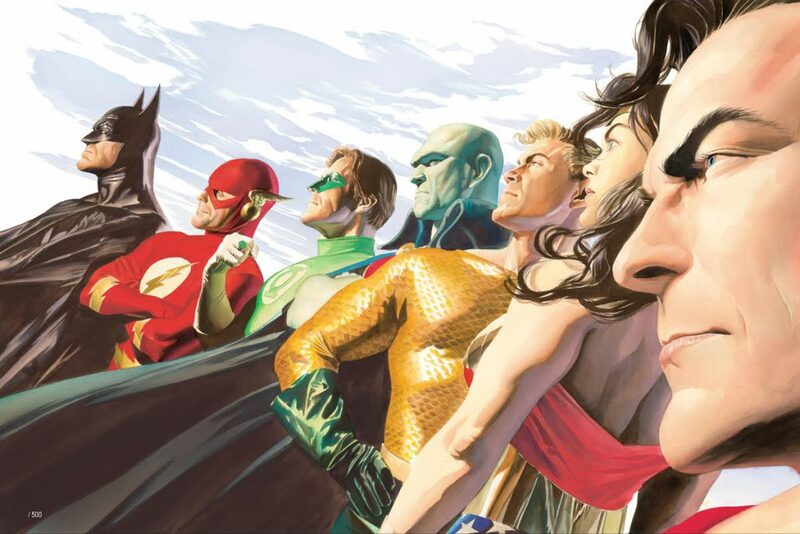 For his image-altering comics work, Alex Ross is being inducted into the Pop Culture Hall of Fame. Initially a commercial storyboard artist out of school, he was tapped to illustrate a series of Terminator comics for Now Comics. His first work for Marvel came just a couple years later with the 1994 miniseries Marvels. His biggest breakthrough was his work with Kurt Busiek on Astro City. Ross “only” did the covers and the character designs, but his stylings are so influential and powerful that even with other artists handling the inside pages, it feels like he owns the entire project. His best-known work might be his DC superheroes comics. He rendered Superman, Wonder Woman, Aquaman and others in a classic, friendly, familiar fashion with outfits straight out of the SuperFriends cartoons but with a much more serious edge. Readers felt like these characters grew and matured in real life as a result. 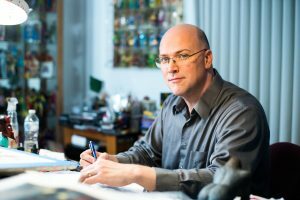 Because of the increasingly lengthy process of his detailed art, he rarely works on interior pages, focusing on covers, character design, and plot and pacing. His work has also served as the basis for various high-end action figures and statues. Ross’ style has been compared to Norman Rockwell and Andrew Loomis (he admits they were early influences). By applying that kind of natural looking light and realism to comic stories, he revolutionized the genre. His ability to make superheroes seem so real has also landed him gigs as character and set designer for various movies including the first two Sam Raimi Spider-Man films and M. Night Shyamalan’s Unbreakable. He even created an official poster for the 2002 Academy Awards, showing the Oscar statuette in an unmistakably Batman pose. For years, Comics Buyer’s Guide handed out a “Favorite Painter” award for the comics industry, but eventually retired the designation as Ross kept winning it year after year. The Pop Culture Hall of Fame is happy to hand him another honor.